I missed covering the last time Open Mike Eagle put out an EP. And if you know anything about the hip-hop content on this channel and how often Open Mike Eagle has made my year-end list, I won't be making that mistake again. And really, I'm not sure why I didn't review A Special Episode Of in 2015 - it was already a pretty strong year for hip-hop, I wouldn't have objected to another great project on the pile, especially considering my rules for EPs were flexible at best, even then. And yet when you consider the other years of which I've covered him... well, Dark Comedy was only beaten back by Run The Jewels and Jason Eady, and Brick Body Kids Still Daydream was only narrowly beaten out by the Mountain Goats, and even Hella Personal Film Festival with Paul White was my favourite hip-hop album of 2016 - if that's not a stirring indictment of how lyrical and potent of an MC he is, I don't know what is! But Open Mike Eagle has had a busy year regardless - between podcasts, a show on Comedy Central, and a pro wrestling bout that showed him holding his own in the ring on the indie circuit, I was a bit amazed he had time to cut and promote another project... but hey, six tracks on his own new label, I wasn't about to sit this one out even amidst a strong year for hip-hop, so what did we get from What Happens When I Try To Relax? Well, this is an odd EP to talk about. I shouldn't have to say that it's far from bad, it's actually pretty consistently great, but it's a different sort of listen than his past three full-length albums, with the comparison that came first to mind - and bear with me on this - was that to Lupe Fiasco's abbreviated mixtape Lost In The Atlantic. Crazy clever in its wordplay, sure, but also an uncanny step towards mainstream trends intent on taking the piss out of them to intentionally disorient both indie and mainstream audiences who might not be expecting what's coming. 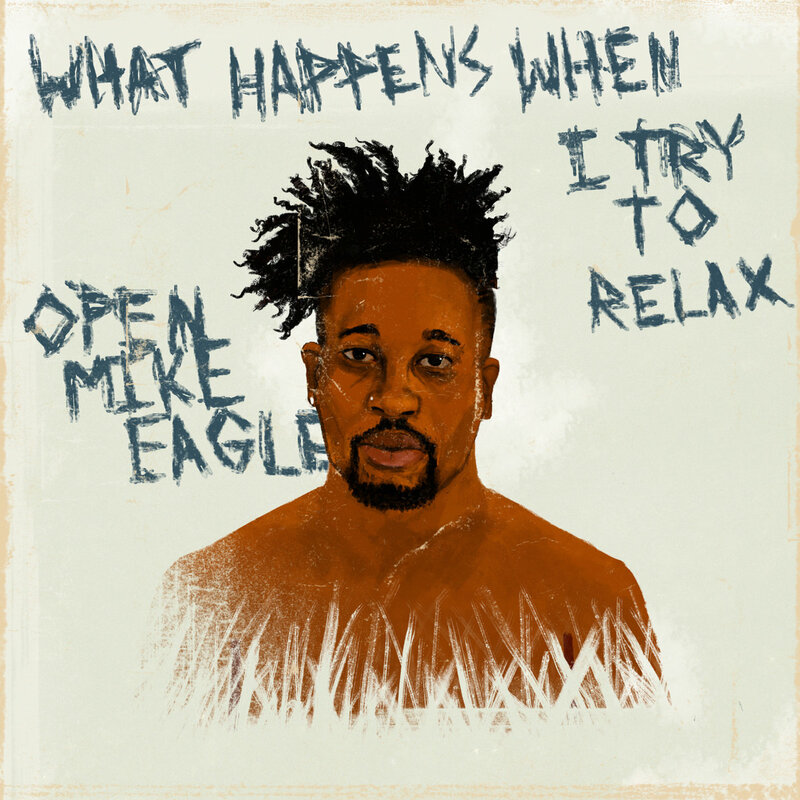 Now I'd definitely argue Open Mike Eagle stuck the landing far more effectively - namely because there's no label drama, he's markedly more self-aware and direct, and the thematic core feels a bit more balanced - but I can see how this might not go down as easily as his more critically acclaimed work. And here's the thing: even despite giving this a lot of listens and cluing into what Open Mike Eagle is trying to do, this can still feel like an uncanny listen, especially against the larger context of mainstream hip-hop and his left field career. I'll always be a big fan of his voice and knack for melody, but to hear him pick up a more yelping delivery and spit triplet flows like on 'Relatable (peak OME)' is intentionally jarring, especially against the glittery synths and lumbering trap beat. And make no mistake, Open Mike Eagle knows that this will sound awkward or discombobulating - hell, he's counting on it, that's the big joke of it all that suddenly gets a lot less funny when he that relatability to a less discerning audience gets punctured by his socio-political reality. And those subversive dark jokes, often riding on the punchline of "accessible" production, can give these songs a lot of edge - 'Every Single Thing' takes misty gothic pianos against a crushing bass beat that don't feel that far removed from tones you'd hear in Soundcloud rap that distorts his voice ever so slightly, and it's a song about conforming to unfair stereotypes under the assumption that everything about the black experience can be understood and recycled by an audience that never suffers the same risks. The hook references getting 100% on a video game that can be replayed over and over, but for people in America the stakes are much higher, where like Pete Rose Open Mike Eagle is forced to bet on himself and see his style driven out of the mainstream, especially in a world where he can't tell the truly dangerous from those who just don't perceive... and he wonders if there's even much of a difference, especially when people of all races will default towards stereotypes on some level. But then it circles back with the Arca-like glossy synths and trap rumblings of 'Maybe Gang (an initiation)', where black men have had to grow comfortable with self-reflection in the face of lingering trauma that he sees more similarities than differences in his kin... and while he doesn't want to call it a gang, that might just be what it is. And here's an important thing to note: I'm not the target audience of that song - hell, I don't think I'm the target audience of this entire project, the tangled thoughts and doubts that Open Mike Eagle tries to peel through in a moment to breathe, and it makes sense fellow rapper milo is referenced here because the sentiment of 'flourishing in the lag time' is just as prevalent, getting that moment to breathe. But for Open Mike Eagle, it does run deeper, because he's speaking primarily to the black kids amidst a white audience, spoke most plainly on 'Southside Eagle (93 Bulls)' which is probably his most familiar production with the gliding cymbals and deep echoing beep and misty snap recalling Dark Comedy but also speaking on how despite all of his hustle he's still in the red! Part of this is running left-of-center - and boy, does he know it, as his 'right path' never really revealed itself - but some of this necessarily comes through an increasing disconnect between the stories told in his art and the reality of his work as an artist. Hell, he describes Brick Body Kids Still Daydream as an audio mural about his aunt in Chicago to whom he doesn't even talk, and then uses a series of loaded references to the self-flagellating 90s alternative scene consumed in self-loathing and heroin... and that on some level he winds up feeding, going to the Northside of Chicago to play Pitchfork. And in that subtext is a loaded question of accountability, as he tries to speak his message to the black kids in the audience for the resonant, relatable experiences... but knows the predominantly white audience will only pick up the surface-level angst and conflate art and artist, missing the point in the same way so many did with grunge. Now there are two other songs on this EP, one I like a great deal and the other... less so. The former is 'Microfiche', an introspective examination of the privilege he does now have because of his work - he can afford to go to the dentist and get new shirts if he puts on weight, and more tellingly he feels awkward talking about the pain he does feel now, even as it lets him bash the NFL, hide his weed convincingly enough so not to get questioned that hard by police, and embrace a slightly more comfortable lifestyle - after all, the vampires that would leech of fame aren't coming for his pen or his social commentary, especially with the bubbling muted gloss and more defined bassline - and yet the hook emphasizes how it can all go away so quickly. Unfortunately, now we have to talk about the one song I don't like, 'Single Ghosts', which seems like a love song about a ghost until you realize it's an extended metaphor for someone who only seems to exist online or through social media. And it's a good song - I like how Open Mike Eagle emphasizes a certain glamour in this person's curated existence, and his general contempt for Instagram on the next track does add some continuity to why it's here - but I'm not exactly a huge fan of the production; the clipped beat sounds brittle, the pitched-down backing vocals don't help, and the grainy contorted horn sample just doesn't quite click. And thematically, it does feel a bit tenuous to be tied with the rest of the album - the social media connection can be disruptive to one's relaxation, but I'd argue 'Check To Check' on Hella Personal Film Festival went a bit further there. But as a whole... yeah, I really did enjoy this, and I wanted to make sure I got this as right as possible: on 'Southside Eagle (93 Bulls)' he did warn me to get this airtight, and I think I'm close. That said, I wouldn't put this among his best releases in his full-length catalog, if only because the greater number of tracks would give him more room to spread out and deepen the themes, and there are cuts here that don't quite have the same density I love and appreciate about his work. But for me... yeah, great EP, easy 8/10, absolutely recommended if you're a fan or even if you're looking for an inroad to Open Mike Eagle with production that is certainly contemporary. Again, can't promise it won't feel uncanny or throw you for a loop, but like with all of his projects, I think it's worth it.